Actresses Daria Yemelyanov (Masha), Linda Akhmetzyanova (Irina) and Irina Krivonos (Olga) (left to right) in a scene from the play "Three Sisters". Performance is put on the body language, the text is translated in the form of subtitles, Moscow, Oct. 9, 2015. 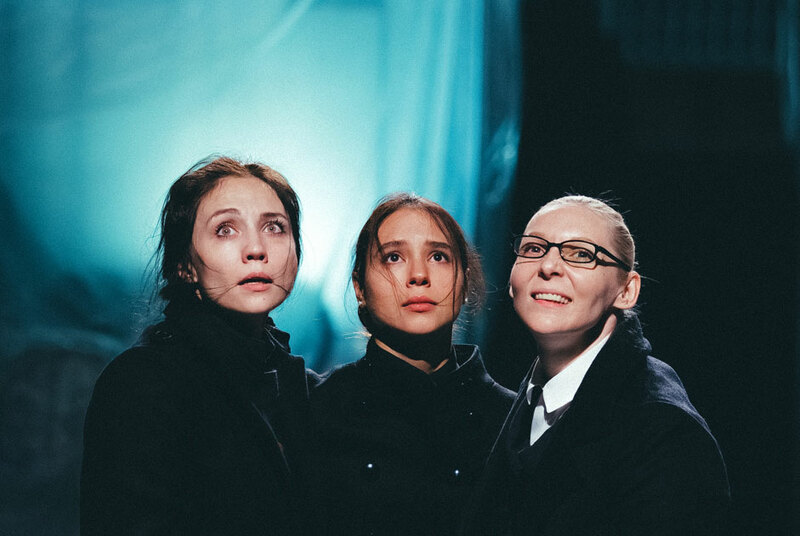 Actresses Daria Yemelyanov (Masha), Linda Akhmetzyanova (Irina) and Irina Krivonos (Olga) (left to right) in a scene from the "Three Sisters" play of Novosibirsk Drama Theater "Red Torch". Performance is put on the body language, the text is translated in the form of subtitles, Moscow, Oct. 9, 2015.